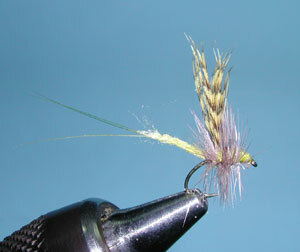 Notes: Extended Bodies for mayflies are not difficult to tie. 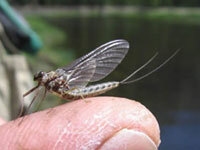 They add an element of realism to the dry fly presentation that is often a trigger mechanism for the trout to strike. There are a number of techniques to create an extended body. Perhaps the simplest is the use hollow tubing that comes in a number of colors and diameters. 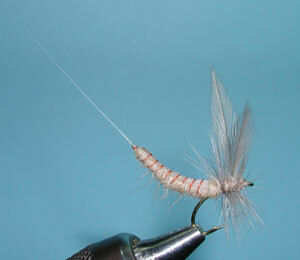 This is particularly usefull for extended bodies on smaller mayflies such as Blue Wing Olive and PMD's. For the Blue Wing Olive, I use this material and create a segmented appearance by using a heated plier that marks the tubing. Another simple technique is to apply Superfine dubbing to a needle and add Softex to the material. Twist the material with your fingers and remove once dry. You can create segments by pinching the material with a serrated hemostat. This is the technique I used on the PMD. 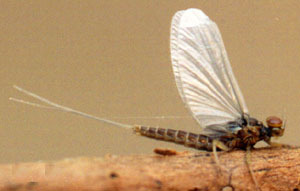 Extended Bodies are generally more common on larger Mayflies, such as Green Drakes, Gray Drakes, and Hexagenia. On these patterns, I use a needle base in which the material is tied around a needle with thread and slid off the needle to attach to the hook. 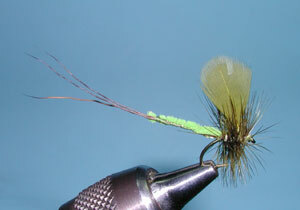 On the Western Green Drake, I attach 3 moose mane fibers to a needle with thread wraps. Ending my thread wraps where the abdomen body would end, I attach a piece of ultra chenille with 4-5 overlaping thread wraps and spirol wrap the chenille to the other end. The thread is whip finished to secure and trim. The Gray Drake extended body is a little more involved. First, I apply dubbing wax to the needle and then lay a small amount of z-lon over it. Attach two microfibetts for the tails and lay a good thread foundation over the material. 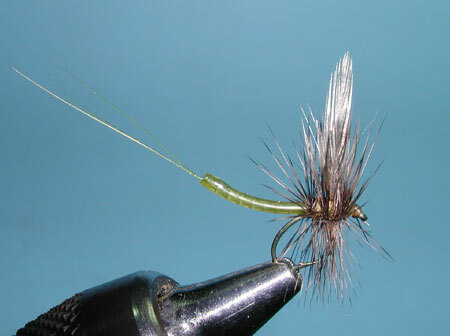 Bring the thread back to where the end of the abdomen should be and attach a dozen deer hair by the tips to the base of the tailing materials as well as a piece of thread for ribbing. The deer hair will be a halfback to the abodomen. Next, dub a tapered body and pull the deer hair over the top. Secure with thread wraps. Then, pull the deer hair over the top and secure with some additional thread wraps. Whip Finish. Apply a good dose of Head Cement over the body and pull the body away from the needle.